There is nothing like the warmth, look and feel of real hardwood timber flooring. 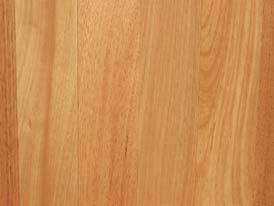 What's more, real hardwood timber flooring is easy to clean and ideal for allergy sufferers. Our range of engineered hardwood timber floorboards are made from real hardwood timbers incorporating a number of features designed to provide convenience and to save you time and money. Short acclimatisation period. Our engineered hardwood timber floorboards need little acclimatisation. Installation can usually commence the day after delivery. In extreme weather conditions we suggest 2 days of acclimatisation after the weather has settled. Tongue and groove inter-locks each engineered hardwood timber floorboard for faster installation. Easier to install saving you time and money. Floating system. No nailing is required making our engineered hardwood timber floorboards suitable for apartments, units, townhouses, leaseholds and exhibition stands. Pre-varnished. Our engineered hardwood timber floorboards are pre-varnished so there is no varnishing needed at the installation site, saving you time, money, and the varnish odours. Pre-sanded. No sanding is required as our engineered hardwood timber floorboards come pre-sanded, saving you time, money and avoids dust being generated at your installation site during sanding. Ready to walk on once installed. There is no waiting for sanding or varnish to dry with our engineered hardwood timber floorboard. Environmentally friendly. Our engineered hardwood timber floorboards uses various grades of sustainable timbers. Allergy-free. 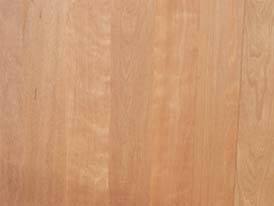 Our engineered hardwood timber floorboards are easy to clean and suitable for asthma suffers. Long life. Just like real timber floorboards our engineered hardwood timber floorboards last a long time and can even be sanded back and restored after years of wear and tear. Each timber species in our range of engineered hardwood timber floorboards has a high Janka hardness rating, unique colours and grain characteristics that will complement, blend and cater for any installation, be it a home, office or retail store. 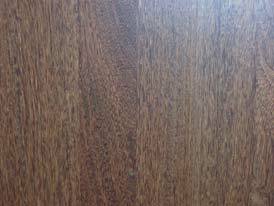 Layer A : 4 mm thick lamella walking surface of real hardwood timber. 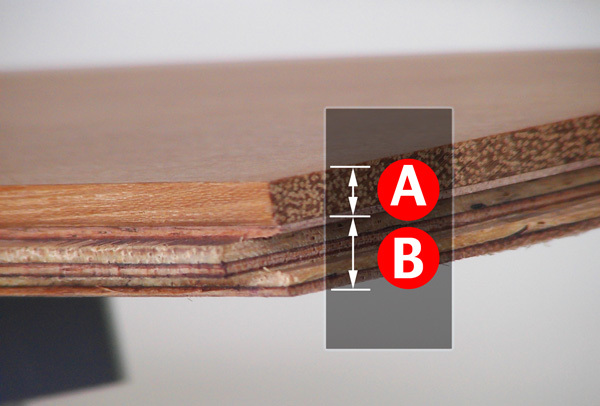 Layer B : 6 mm thick marine grade plywood. The top layer - A - of our engineered timber floorboards is real hardwood timber sourced from a range of different hardwood species including Sucupira, Tatajuba, Brazilian Pear, Brazilian Oak and Jatoba. 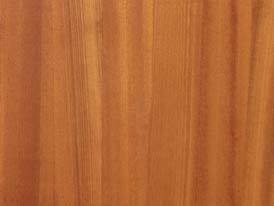 Each timber species has a high Janka hardness rating, unique colours and grain characteristics that will complement, blend and cater for any installation, be it a home, office or retail store. The engineered timber floorboards start with raw hardwood timber which is dried and cut into 4 mm thick slices called lamellas. The lamellas are then cut into lengths and meticulously selected to ensure each piece of timber is free of imperfections and thus providing a high-grade finish. The hardwood timber is then sanded smooth, varnished with 7 coats, and bonded to a substrate layer - B - of marine grade plywood, which significantly strengthens the floorboard. Packs contain varying lengths from 450 mm to 900 mm long. 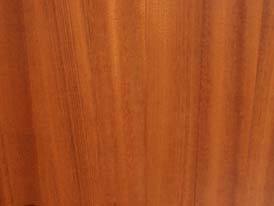 10 mm thick consisting of 4 mm hardwood timber walking surface bonded to 6 mm marine grade plywood veneer.